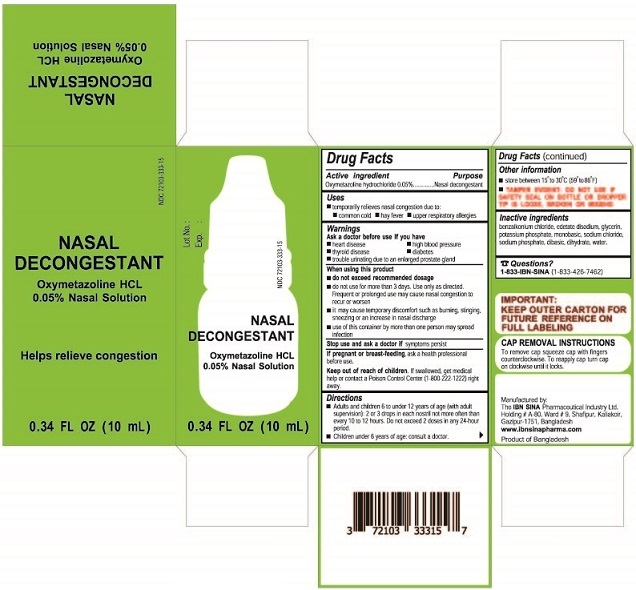 Proprietary Name: Nasal Decongestant What is the Proprietary Name? Non-Proprietary Name: Oxymetazoline Hydrochoride What is the Non-Proprietary Name? 72103 - The Ibn Sina Pharmaceutical Industry Ltd.
Nasal Decongestant with NDC 72103-333 is a a human over the counter drug product labeled by The Ibn Sina Pharmaceutical Industry Ltd.. The generic name of Nasal Decongestant is oxymetazoline hydrochoride. The product's dosage form is solution/ drops and is administered via nasal form. Labeler Name: The Ibn Sina Pharmaceutical Industry Ltd.
DirectionsAdults and children 6 to under 12 years of age (with adult supervision): 2 or 3 drops in each nostril not more often than every 10-12 hours. Do not exceed 2 doses in any 24-hour period.Children under 6 years of age: consult a doctor. Inactive ingredientsbenzalkonium chloride, edetate disodium, glycerin, potassium phosphate monobasic, sodium chloride, sodium phosphate dibasic dihydrate, water.